kewl.. and a welcome aboard seems to be in order. Makes me wonder what people do with the fender tag lol. Looks like a nice find. Missed this post. Nice car and a great find. Keep us posted on the project. Welcome to 'Style, looks like nice find and hope that 340 is hot. Good luck with your project and keep us up to date. Nice but I'd leave it RED! Maybe the red from 40 years ago my last red was on for 20 years no fade base clear was the ticket. Love an A in sublime. You should see the red is like on my 97 Ram pickup. I bought it over 10 years ago and got it cheap because the paint was dying on it. My only other car that was red was dead too...a 67 Dart that I had in early 74. No more red cars for me but I really don't care that much the color to begin with. Welcome to mopar style. And I love darts, I had a 71. Nice car, looks like its in pretty good condition. Nice senic background pic too. 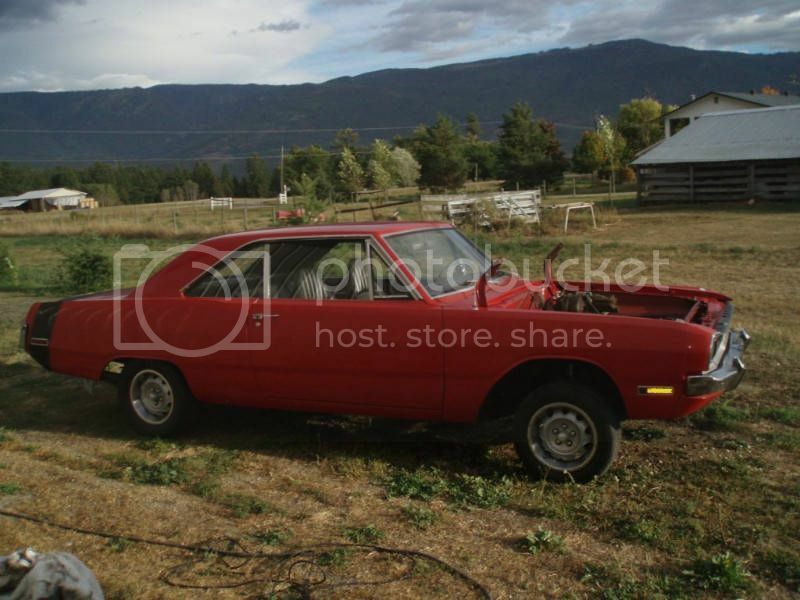 welcome Nice car I used to own a 71 dodge demon also red with a 340 in it. Wish I never sold it. Greetings! Looks like an interesting project.